Commandeered by Militant Angeleno @ 12:14 AM No comments: Hyperlinks, yo! Ethnic Iced Dessert Quest - Part 7: Break On Through To The Nam Kang Sai! As you may or may not know, it's pretty freaking hot this weekend! 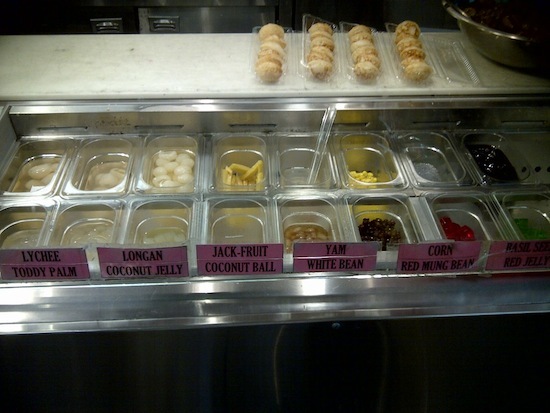 Which inspired The Militant to re-visit his Ethnic Iced Dessert Quest series he did Back In The Day. If you're a longtime reader of The Militant, you know what's up. 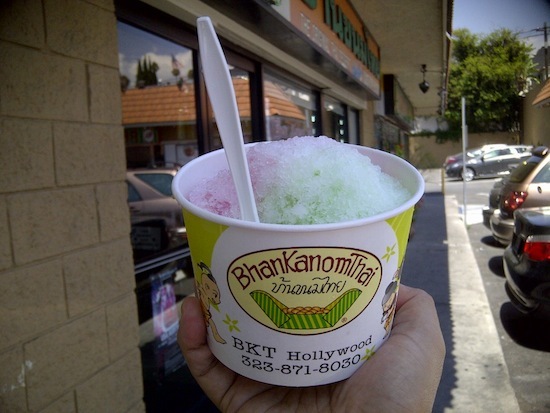 The Militant went on a quest around Los Angeles to find some cool, refreshing ethnic desserts based on ice. He took you from South Korea (Bingsu) to Singapore (Ice Kachang) to Taiwan (Chhoah-Peng) to Japan (Kakigori) to Indonesia (Es Kampur) to Mexico (Raspados) -- and he didn't even have to leave town! Nearly five years later, The Militant picks up where he left off. Unfinished business! This time, he took the Red Line to Thai Town and became a Thai-Iced (Militan)-T! He found himself at Bhan Kanom Thai (or "BKT" as the locals call it) sweets shop on Hollywood Blvd, where they made him a Nam Kang Sai - a Thai shaved iced dessert consisting of your four choices of jellied Southeast Asian fruits, a mound of shaved ice, some colored sweet syrup, and a glazing of condensed milk. It might have been the heat outside, but it was pretty awesome! The syrup flavors were more subtle, and not the diabetic shock, HFCS-laden stuff you'd find at a Sno-Cone stand. The red color smelled of jasmine. It was placed in a large cup, the same size you see at your favorite Fro-Yo joint. The Militant was ready to pay like $5-$6 for this cup of sweet frozen joy. Until he heard the price. THREE BUCKS?!?!? Like WOW! That's pretty freaking awesome! You can't beat that anywhere! Not only that, but the place is open 'til 1 a.m. every day! And it's just like two blocks from the Hollywood/Western (M) Red Line station! So on a hot day like today (or tomorrow even), cool off, Militant Style with some Nam Kang Sai or any of the wonderful ethnic iced dessert treats around town! 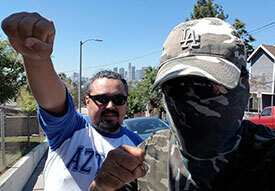 Commandeered by Militant Angeleno @ 4:42 PM No comments: Hyperlinks, yo!